Those of you who have read this blog through multiple seasons know that I tend to take a rather laid-back approach to protecting vegetables when the weather turns cold in the fall. My typical attitude is that summer vegetables (peppers, tomatoes, etc) have probably about run their course by the time we get to a frost, and you might as well let them go. On the other hand, vegetables like lettuce, radishes, carrots, cabbage, etc are quite cold tolerant. They don’t need any protection until it is going to get down into the mid-20s overnight. Since we are looking at an early frost this weekend, what to do? (I think this is actually the first early frost in the 5 years I’ve been here. The “usual” since I’ve been here is a frost in early November and often not a hard freeze until December.) The reality is that if you cover your plants for Saturday night, you will probably be able to keep them going for at least another couple of weeks. 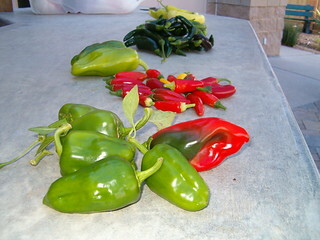 The question then becomes, will you really get much more ripening on the tomatoes, peppers, etc in that time? My guess is probably not, because even though we aren’t expecting another frost, the highs are going to be the 60s and 70s, while the lows are going to be mostly in the 40s. That overnight temperature is going to start pulling the soil temps down quickly and really slow down growth and ripening on those summer vegetables. I’m planning to head to our community garden plot tomorrow and pick off the remaining tomatoes and peppers and then see what the weather does. However, I still have a bunch of basil and lemongrass that I want to preserve. These semi-tropical and tropical plants can sustain some damage even in the 30s. I am not ready to harvest and deal with them yet, so we are planning to cover the herbs to keep them going. Our favorite way to preserve these herbs is to mince them in a food processor and then freeze them in either water or oil in ice cube trays. I’ll try to put up a post about that process when I get to it. The Master Gardeners also planted a bunch of garlic in the Demo Garden this week, so I’ll try to get a post up about that process sometime next week. Posted on October 5, 2012, in Around the Garden and tagged early frost, fall, frost, garlic, herbs, peppers, summer vegetables, Tomatoes, weather. Bookmark the permalink. Leave a comment.